Elisha Siegel finds bits of old school Boston on the corners of the North End. I usually avoid the North End. It might make me a coastal elitist, but I never go there without an out of towner in tow. I think of the neighborhood as just another stop along the Freedom Trail - a tourist trap populated by map toting travelers, bloating restaurant wait lists and cannoli lines. So now that it’s time to research this piece, I’m not really sure what to look for. I don’t have much of a plan except to avoid Hanover Street’s urban theme park vibe and walk the neighborhood until I find something with a more grounded aesthetic. Before all the snow melts and the weather turns warm, take advantage of the chocolatey treat-in-a-mug at one of these six stand-out spots. This is the closest to European-style hot chocolate you'll find in the area. Thicker than your standard hot cocoa, a little of this rich, decadent treat goes a long way, which is a good thing since you’ll pay a premium for their top-quality chocolates. But it’s worth it. The single origin chocolates at L.A. Burdick make some of the finest drinking chocolates available. Read more about It's Still Hot Chocolate Season. Here are Six of the Best Around Town. Even heavy snow won't keep Elisha Siegel away from some of his Chinatown favorites. Nobody ever said food writing was easy (or hard) but when you’ve procrastinated down to your last day and a deadline looms you do what you must to get the story. Even if that means going out and eating in two – no three – Chinatown restaurants when your hometown is threatened by an historic Nor’easter. The local news is predicting a snow storm the likes of which we’ve seen a whole bunch of times and panicked citizens are hoarding bread and milk. (Why is it always bread and milk?) But I have a job to do - one that literally nobody depends on, but makes my mom a little proud. The fireplace is on. A couple of westies are running around excitedly. And two tables are set in the dining room. 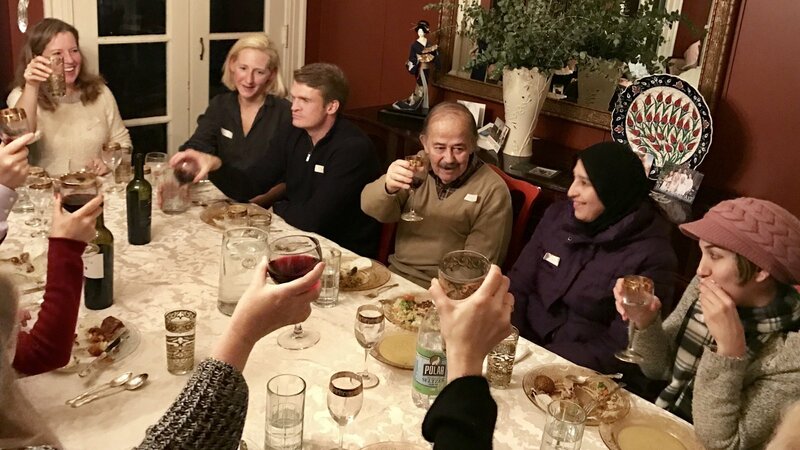 The dinner party on this brisk winter night in Maplewood, N.J., has a distinctly foreign flare: chicken shawarma and falafel are on the menu. And while the conversation includes typical talk about work — it also deals with war. "Every day is becoming terrible," explains Hayder Alqaysi, who fled Baghdad with his mother and sister. "You understand what I mean? I cannot live there." The Yiddish word "haimish" means"home-like, friendly, folksy" and that's just what you'll get at this modern take on all things deli-kitsch. That, and the most delicious pastrami this side of NY. It’s January in Boston and the potential for harsh winter storms still looms large in front of us. If you ask me, it’s time for some comfort food – and I found some of the best. Matzah ball soup so rich you can taste the schmaltz, potato latkes so crisp your tablemates may fight over them, and pastrami so flavorful you’ll keep coming back for more. With a bad case of Winter Blues, Elisha Siegel travels to Dorchester to sample from the neighborhood's best West Indian spots. I’ve been out of the chew and scribble game for a while now. Last time you heard from me it was July and I was hanging out by the beach working on a tan to go with my body-by-pork-belly. Now we’re deep into wintertime darkness and I’m desperate for a little sunshine. Since a Caribbean vacation isn’t in the budget this year, I’ll do what I do best and eat my way through Dorchester’s vibrant Caribbean food scene. Make reservations, not ham. From a comfortable beer bar to a classic castle, your choices for eating out on Christmas go far beyond the obvious. Almost every single Chinese restaurant and hotel restaurant in the Boston area will be open on Christmas, so there’s certainly no shortage of places to dine. However, if you’re looking for an experience that feels unique for the holiday, whatever that means to you, here are a few other options. We're not just talking about Bagelsaurus. (Although - spoiler alert - it certainly tops the list.) Check out all of these local shops making fresh bagels every day. 1. Don't expect one single comparison to New York City bagels here. Why beat a dead horse? If you want an NYC bagel, the island isn't really all that far away and buses leave regularly. However, if you're not looking to go that far, you'll actually find some pretty outstanding bagels made right here at home. They’re not Katharine Hepburn’s infamous brownies, but trust us, they’re just as memorable. We can’t all be Katharine Hepburn — though thankfully, we can still make her brownies! If you're dreaming of a vacation to the Greek Isles but plane tickets aren't in the cards, you can at least take your taste buds there. From hearty gyros to classic ouzo to comforting avgolemono, check out these 5 spots. When you travel through Greece, every meal is a celebration. Pop into an ouzeri in Athens, and you’ll be snacking on stuffed grape leaves (dolmades) and downing anise liquor while loud musicians play in the corner. Grab a two-euro gyro on the tiny island of Hydra, and you’ll stuff down that crispy meat pocket with abandon as the streetlights dim. Maybe you’ll order shrimp saganaki (a seafood dish with an ouzo-tomato sauce and hefty chunks of white cheese) at a classic taverna, where a burly man will sit next to you and explain all the other items on the menu. Until the festival begins on September 15th, we'll be introducing you to the chefs, restaurants, wineries and brewers giving local flavor to the big event. Here's another enticing installment. As great as the Boston seafood scene already is, I’m always excited for another addition to the landscape. One should have lots of options when it comes to eating their weight in lobster, sole, and calamari. In this vein, Boston has a new venue for sustainably sourced seafood. Kathy Sidell opened Saltie Girl this June in Back Bay, next to one of her other restaurants, the MET Back Bay. Bourdain introduced Belle Isle Seafood to the world, but this quiet beach town has plenty of other good eats. It’s easy to think of Winthrop as the end of the world. The funny shaped peninsula juts out from Revere and hangs in the Atlantic Ocean east of East Boston. It’s cut off from the MBTA (the closest stop is Orient Heights after which your options are a Winthrop city bus or a two mile walk). This isolated beach town almost feels out of place, like it belongs on the New Hampshire seacoast or up in Maine. Show love to small-batch local foodmakers (and your taste buds!) with these 7 prepared foods from area farmers’ markets. I previously wrote about ten local farmers’ markets for this splendid summer of 2016, and in the couple of months since, I've eaten my weight in farmers’-market foods, from produce to cheese to sausages to baked goods. I am especially enamored by the prepared foods. When it comes to summertime cooking, I either have a sensible grasp of my strengths and weaknesses, or I’m a lazy millennial, depending on whom you ask. One square mile holds a huge variety of delicious, authentic and adventurous food representing multiple East Asian countries. When I think about Allston, I’m mostly reminded of my early twenties — a hazy pastiche of nights barely remembered. But as I’ve gotten older, and considerably less drunk, I now spend my time thinking about where to score the best yakitori instead of my next Jaeger shot. Thankfully, Allston also has an incredible concentration of East Asian restaurants, where you can assemble a nice tasting menu of the region’s many cuisines. Chill Out With These 8 Refreshing "Grownup Milkshakes"
When you can't decide between ice cream and a cocktail to beat the summer heat, seek out one of these boozy frozen treats. When mid-summer humidity hits and work days need to feel a bit more Bermuda, the perfect solution comes from the freezer and the liquor cabinet. Whether it’s something tropical like a piña colada or something down-home like a bourbon milkshake, it doesn’t matter to me: A boozy frozen treat is the only way to beat the heat, and the workweek. Several spots around town serve their cocktails swirled and chilled, in the form of ice cream drinks, tiki bar favorites and inventive slushies. Read more about Chill Out With These 8 Refreshing "Grownup Milkshakes"